This parang is based on the Iban style of parang (The Iban are a tribe in Borneo). The original was shown to me by a member of the forces who had used it exclusively as his jungle tool for 16 years. 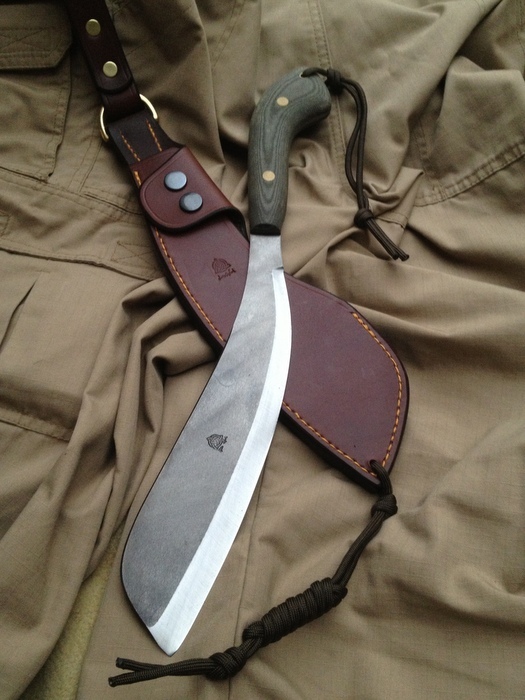 When I saw it I felt that its compact size and curved cutting edge would be completely suited to our own native woodland environment and have adapted it so it is almost a ‘hybridized billhook’. The main change from the original is that it has a full tang construction which adds a phenomenal degree of strength, better balance and overall peace of mind that the handle can never become detached from the blade. The combination of the curved blade and the convex grind gives strength with incredible slicing ability. The bevel extends very close to the handle with a minimum amount of choil to allow the tool to also be used for fine carving tasks. The spine of the blade has been chamfered for comfort when strangling up the blade for finer work. The area just in front of the handle has been left square to allow for scraping and for use with a firesteel. It is made from 3.8 mm unground 01 carbon tool steel which gives a more durable surface that helps prevent corrosion and also gives fantastic edge holding ability plus the ease of sharpening that 01 carbon steel gives you. This model has a textured green canvas micarta handle, the benefits of which are that it is completely inert to environmental change and the textured surface maintains a good grip even when wet (other handles are available, please contact us for advice). The handle scales are held in place by brass Loveless style bolts, thong tube and industrial two part epoxy glue giving an extremely secure fit. The handle comes with paracord added which can be worn around the wrist to give additional security when making heavy chops. The sheath is made from 3.5 mm – 4 mm leather and is hand-stitched in our normal manner using striking yellow thread. It has a welt made from very tough blocking leather (the leather used for the soles of shoes) to give the sheath extra rigidity. The sheath style itself is designed so that the blade can be drawn ‘up and out’ of the front of the sheath rather than have to draw it up the whole length of the sheath which can be very awkward. The parang is held in place with a leather flap and two press studs. It has a scandi-style dropper to allow for sufficient movement on the belt and also lowers it enough so that a rucksack can be worn comfortably at the same time. It has a lanyard hole at the base of the sheath so that it can be tied around the thigh to prevent too much lateral movement. Kydex sheaths available. Please email us to check availability of this product.